Sorrento is a magnificent town 20 miles south of Naples, on the cliffs above its eponymous Bay. Popular since the early 19th century, it has attracted travellers from the wealthiest aristocrats of Europe and beyond to adventurers and traders wanting to tap into the riches of the land and sea. Undoubtedly one of the most elegant of Italian towns, Sorrento is also a great base to explore the many sites of Campania. Naples, Vesuvius, Pompeii, the islands of Ischia and Capri and the Amalfi coast are all within a short journey, and the views of the Bay of Naples from all over the town are stunning. It is relatively easy to reach Sorrento from London with both EasyJet and British Airways flying directly to Naples. The food and wine are exceptional, but the lemons of Sorrento are the real star, making for the best Limoncello, sorbets and ice creams you will ever taste, more of which later. Celebrating its 180th anniversary this year, the Grand Hotel Excelsior Vittoria is the top 5-star luxury hotel of the region; it is a member of the Leading Hotels of the World Collection, and one of the most iconic hotels in Europe. Just a 20-minute ferry ride to Capri, a little under an hour to the stunning island of Ischia and a quick drive to the amazing Amalfi coast, the Grand Hotel Excelsior Vittoria has been in the Fiorentino family since it opened in 1834. The hotel has welcomed the likes of Richard Wagner, Sophia Loren, Enrico Caruso, Marilyn Monroe, and Queen Margaret and has over the years been featured as a set for movies and television, the video below pays homage to this history and is a great watch. In the movies from Grand Hotel Excelsior Vittoria on Vimeo. Located in Sorrento's town centre, the hotels sits on a high cliff with spectacular views over the Gulf of Naples and Mount Vesuvius. Legend has it that the Roman Emperor Augustus had a villa on this site. The hotel is made up of three interconnected nineteenth century buildings, just above the town harbour (there is a private lift from there directly to the bar terrace 100 metres above). The property is surrounded by a lush Mediterranean garden of 20,000 square metres, in which also the spa and open air swimming pool are located. The public rooms of the hotel are sumptuous, with two luxurious restaurants, a gym, a piano room and the open-air bar overlooking the harbour. Our room had a private balcony with a magnificent panoramic view overlooking the Bay of Naples, and the harbour immediately below. The room was tastefully furnished in a combination of pastel blue and yellow, with period antiques and mirrors it was a grand but peaceful spot in which to recuperate from the heat and crowds of Sorrento. Breakfast was served in the splendour of the Vittoria Restaurant, with its gorgeous ceiling frescos and panoramic views over the Bay of Naples. As well as a choice of à la carte items like porridge, English breakfast and omelettes, there was an excellent buffet. This had a range of juices, cereals, breads, brioches and croissants, as well as fresh fruit salad, cold meats and yoghurts. Of note, the cheese platter offered some local specialties including taleggio and caciocavallo cheeses, buffalo mozzarella and burrata, as well as smoked scamorza, all served with a wonderfully fragrant lavender jelly. The local theme continued with the selection of cakes and tarts, such as the Torta Caprese (almond and chocolate pie), strawberry tart, and an excellent Almond and Sorrento Lemon Cake. As might be expected from a hotel of this calibre, it has off-street parking, and offers a range of services including yacht hire, personal trainers, child-minding, private excursions and even a personal shopper. This trip to Sorrento is one we had long dreamed about, and we wanted to experience the best that the town could offer. The Grand Hotel Excelsior Vittoria is the top hotel in Sorrento, one of the most iconic hotels in Europe, and made our stay in the Amalfi Coast truly unforgettable. Don Alfonso 1890, in the small village of Sant'Agatha, 20 minutes drive from Sorrento, has been run by the Iaccariono family since the original Don Alfonso Iaccariono opened it in 1890. It achieved near mythical status in southern Italy (and three Michelin stars, as well as Relais & Chateaux accreditation) in the 1980s and 90s in the hands of Alfonso and Livia Iaccariono. In recent years the Head Chef post has been taken over by their son Ernesto, although both parents and their other son Mario are very visible in what is today a family-run restaurant with 20 chefs, as well as a hotel and cookery school. There are two set menus in the restaurant - the 'Traditional' has 4 courses and cheese for €145, while the 'Degustation' has 6 courses and cheese for €170. On the à la carte menu, antipasti (appetizers) are all €36, primi piatti (starters) are €34, secondi piatti (mains) are €45. Desserts are €26. We opted for the Degustation menu, and settled in for a long and leisurely lunch. 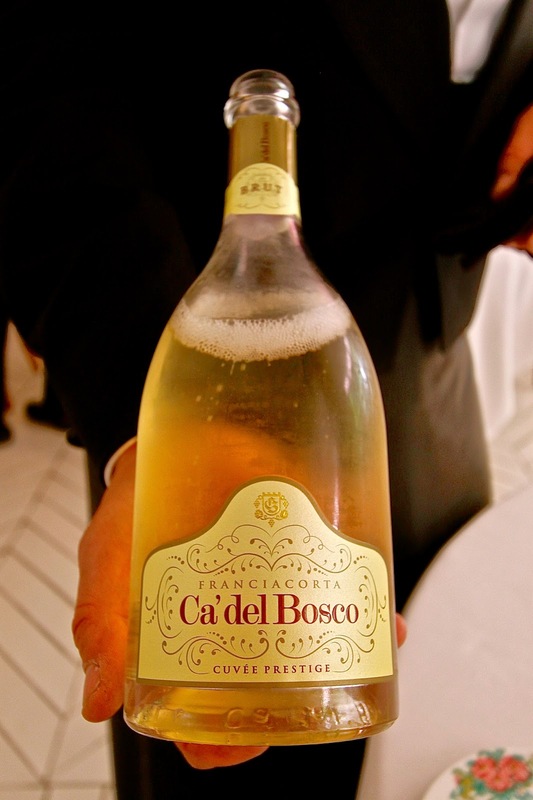 Starting with a refreshing glass of Ca' del Bosco of Franciacorta DOCG, this is a highly regarded Italian traditional method sparkling wine, the Italian equivalent of good Champagne. 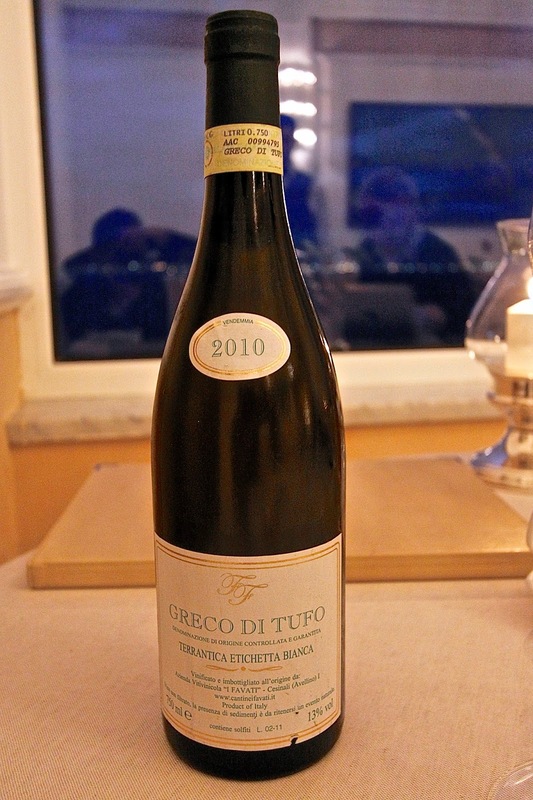 To accompany our meal, we chose a local Greco di Tufo, Pietracupa, 2012, for €50. This was delicious, golden in colour, with delicate lemon and green apple flavours and balancing acidity. The amuse bouche was a very tempting brunoise of vegetables topped with a buffalo ricotta cream, Parmesan crisp, olive oil and balsamic vinegar. Next came smoked Mediterranean yellow tail with wild orange flower with broad bean purée, fennel seed and grapefruit mayonnaise, yoghurt and chives. The fish, only served at its peak of seasonality between May and July, was light and flavoursome, marrying perfectly with a refreshing acidity from the grapefruit grown in the restaurant's own garden. To follow, we had deep fried lobster with two accompanying sauces, one sweet and the other sour. 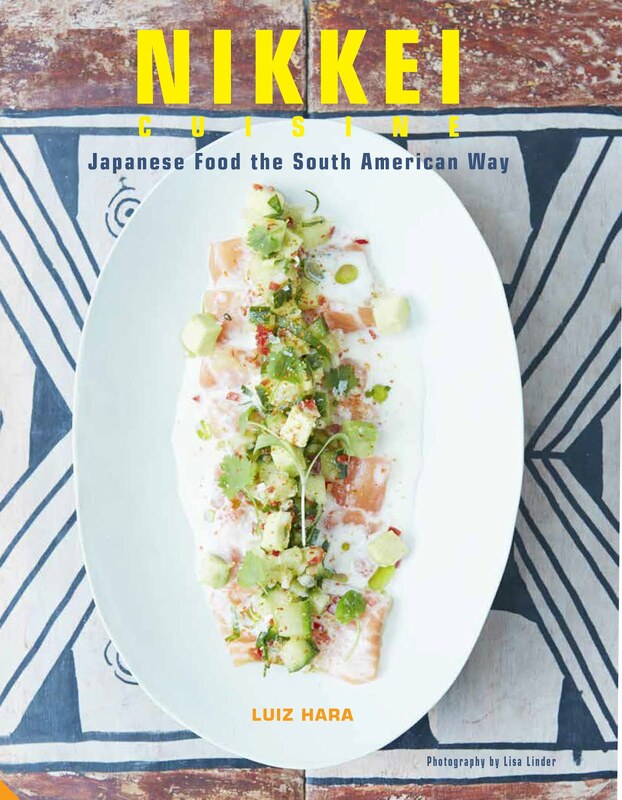 I enjoyed the paper-thin and crisp tempura-style batter, and the clever take on a classic oriental sauce. The pasta course was a magnificent home made spaghettoni with clams, mussels, broccoli leaves, paprika and lemon zest. Encapsulating some of the best produce of the region, this had wonderful rich flavours from the shellfish leavened by the freshness and aromas of the exquisite local lemons. Next came some delicate capelli, stuffed with buffalo meat and served with a mousse of pecorino and onion sauce, and a crocante of carrot, courgette and onion. The crispy vegetables were sliced micron-thin, and dehydrated so that they were still bursting with the flavour of the native vegetable. The buffalo meat was tender and well flavoured. The main course was Lauticauda lamb, from the mountains of Campania, served with finely sliced baby artichoke, a garlic sauce, and a sauce of fresh Mediterranean minced herbs. The lamb was delicious - tender, served medium rare, and accompanied by mint and other local herbs. 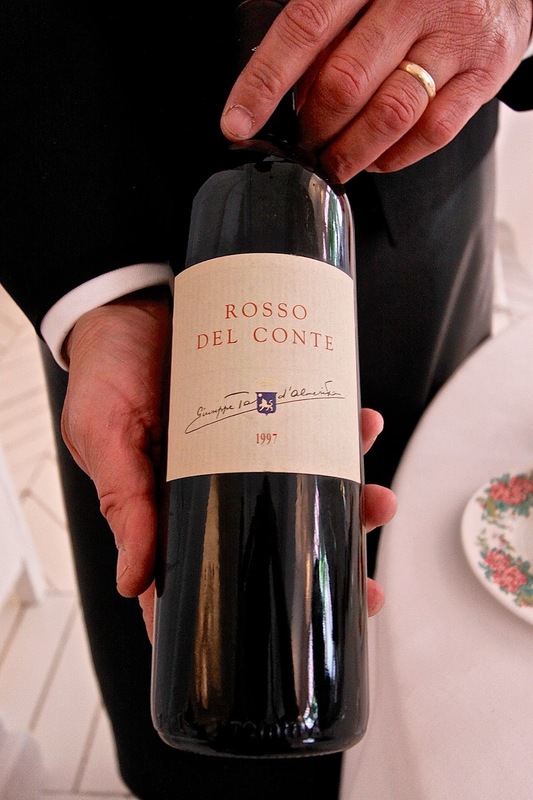 To accompany it, we had a glass of Rosso del Conte, Sicily 1997. A blend of Nero d'Avola and Pericone grapes, this was brown-tinged from ageing and fully mature, with complex notes of red berry fruit, as well as stewed fruit, very soft tannins, and great length. The pre-dessert was sorbet of lemon and strawberry, with mint foam, eaten from a mother of pearl spoon. The flavours were tremendous, and banished from memory the sharp and thin granitas I have had too often in London. The lemons were from the Massa Lubrense region close to Sorrento, which some argue are the best in Italy. For dessert, we ordered the 'Concert of lemon, fragrance and flavours', (seriously, one can never have enough lemons in the Amalfi Coast! ), and the 'Neapolitan sfogliatella pastry perfumed with vanilla and cinnamon', both utterly sublime. As an unexpected bonus, we were also served the 'Impressionistic view of espresso dessert', with coffee zabaglione cream, made with eggs from the family farm. Coffee and zabaglione, a wonderful combination and I cannot think of anything more Italian than this lovely dessert. With our coffees, we were served a glamorous selection of petit fours served over bubbling and steaming vapour. These were a mousse of mint cream, Neapolitan canoli, and salted praline ice cream on a stick, coated in chopped hazelnuts. After the meal, I was lucky enough to have a tour of the cooking school, where many people come as part of a hotel, food and learning package. I also viewed the truly breathtaking cellars with over 10,000 bottles of wine. The deepest parts of the cellar date back over 2,000 years to pre-Roman times. There is a small boutique hotel over the restaurant, with a selection of very comfortable rooms with en-suite bathrooms and an eclectic combination of antiques. 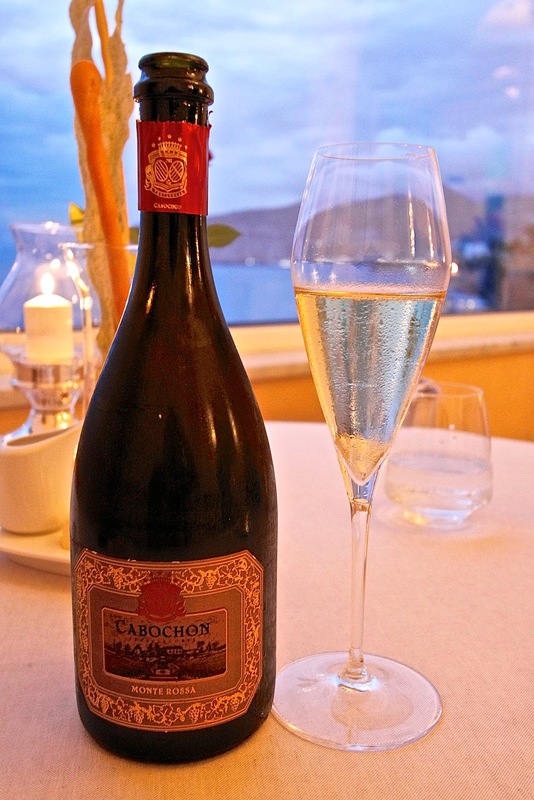 Don Alfonso 1890 is a must for any foodie visiting the region. 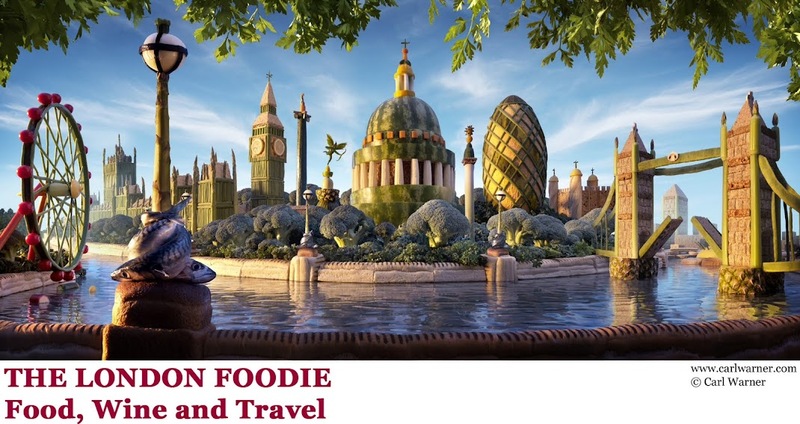 Three, four or five-night packages including dinner, bed & breakfast as well as a cooking class (from €1,125 to €3,100) are also well worth considering. In addition to spending time at the beautiful family farm and grounds of Don Alfonso, the opportunity to cook with the wonderful produce of Massa Lubrensa as well as learning from the very best chefs are gastronomic experiences not to be missed. One of only two Sorrento restaurants with Michelin star status, Terrazza Bosquet is headed by 34-year old Chef Luigi Tramontano, from Gragnano (Italy’s pasta capital) who took charge of the hotel as recently as March 2013, and was awarded its first star 6 months later. Chef Luigi Tramontano had an early start in the kitchen – at the age of 13 he assisted his chef father, and by 18 was working as a chef at the Quisisana Hotel in Capri, a 5-star Leading Hotel of the World property. After further training at Rocco Forte’s Hotel de Russie, another 5-star and arguably the best hotel in Rome, he returned to the Amalfi Coast, this time at the 3-Michelin starred Don Alfonso. Talking with him, it was clear these experiences had a great impact on him in understanding the sourcing and cooking of the best ingredients of Italy. Chef Luigi Tramontano’s latest restaurant, Terrazza Bosquet’s dining room has large plate glass windows with stunning views across the Bay of Naples to Mount Vesuvius. The restaurant offers a Gourmet Mini Set Menu for €90 per person, or a Large Gourmet Set Menu for €120 per person as well as individual à la carte options. To start the evening, we had a glass of Franciacorta sparkling wine (the Italian Champagne equivalent), made by traditional method, from Chardonnay and Pinot Noir grapes. We started with a beautifully presented caponata of vegetables, celery sorbet, and celery gillet. With exhilaratingly vibrant flavours, this set our taste buds tingling for the dishes to follow. Opting for the Gourmet Mini Set Menu (€90), this kicked off with tuna marinated in pistachios from Bronte in Sicily, served with intense orange-flavoured jelly squares, with dots of raspberry and redcurrant sauces. This had great flavours and textures and was stunning to look at. Next came homemade seaweed pasta with venus clams, sea urchin and chives. This was a light, well made pasta, the sauce giving an intense flavour and aromas of the sea from the clams and sea urchin; it was served alongside a fresh sea urchin in the shell, with just a splash of Sorrento lemon juice. These were exquisite ingredients, minimally messed about. The main course was pan-fried fillet of red snapper from the Bay of Naples, served on Neapolitan endive and almonds, accompanied by crispy vegetables and a lemon confit. I thought this was a stunning dish, the fish having a crisp skin yet with perfectly cooked soft flesh, served with crunchy vegetables, and a microns-thin slice of lemon confit(ed) for 48 hours at 50°C. Pre-dessert was a glass of multi-vitamin juice, served alongside a dessert of carrot tart with carrot mousse, with orange sorbet and lemon cream. Light and delicious, this featured the excellent citrus fruit of Campania. For dessert, we had an Easter cake reinvented by Chef Luigi Tramontano, with puffed wheat, ricotta and orange cream pudding with marmalade topping, served with an orange and fennel jus, orange tart and an ice cream of honey and orange flowers. Served with tiny sprigs of dill, this was an outstanding, multi-layered dessert. On the wine front, we were in the capable hands of Head Sommelier Nicoletta, winner of the Italian Sommelier of the Year award in 2007. She is also the wife of the Head Chef Luigi Tramontano - I can only marvel at the education their bambini will have! To accompany our food, Nicoletta recommended a bottle of Greco di Tufo 2010, Terrantico Etichetta Bianca for €40. Golden in colour, this had rich intense flavours of lemon, apple and mineral, like an aged Mersault. 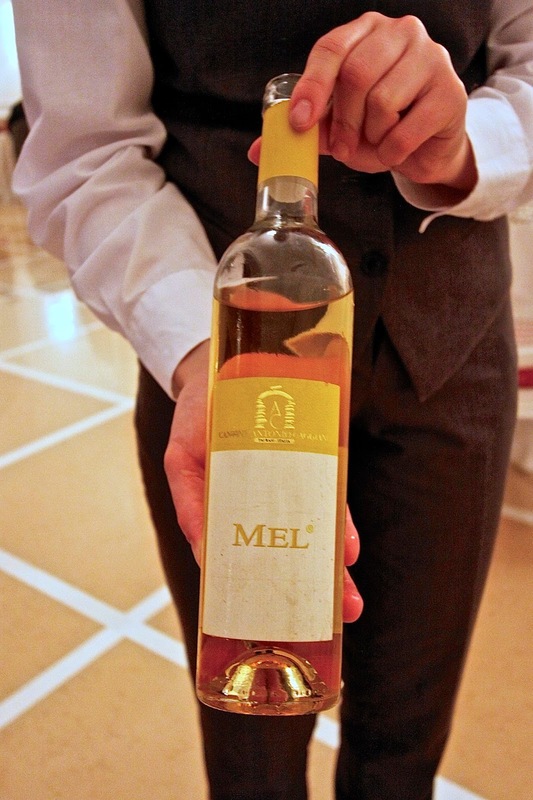 With dessert, we were served a dessert wine, 'Mel' - a sweet Fiano from Cantine Antonio Caggiano. This had luscious aromas of apricot and peach, with counter-balancing acidity. We noted the very reasonable mark up of the wine list, just a little over prices we had seen at some of the town’s wine shops. For cooking of a very high calibre, using the best ingredients of Campania, I cannot think of a better place in Sorrento than Terraza Bosquet. And with a view of Vesuvius thrown in for good measure, what more could one wish for? Highly recommended. Only 17 miles from Sorrento, and a 1-hour drive, Pompeii was one of Campania's most important commercial centres, which was largely destroyed by an earthquake in 63AD, and then sixteen years later in 79AD finished off by the eruption of Vesuvius. Fortunately most of the population had already been evacuated before the eruption, but it is thought that around 2,000 people were asphyxiated by the toxic fumes of the volcano. Today, it offers a unique insight into the ordinary life of Roman citizens during the imperial era, because it froze the way of life as it stood at the time. The site is large, and merits at least a whole day's visit. For more information on Pompeii, visit www.pompei.it. The Corner Shop is a wine merchant in Sorrento, opened by Giovanni who lived in London for many years and speaks excellent English. We went into his shop to buy a bottle of Prosecco, but were lucky enough to meet him and learnt so much about the wines of the region. His knowledge and enthusiasm for the local wines and limoncello were contagious, and we spent a most interesting hour or two in his company at The Corner Shop. I highly recommend a visit to learn more about the local Greco di Tufo, Fiano d’Avolina and Aglianico grapes, as well as sparkling wines. We also learnt a lot about Franciacorta (a DOCG from Lombardy), the Italian equivalent to Champagne which made our trip to Italy all the more enjoyable from then on! Just 20 minutes by fast ferry from Sorrento, Capri was a playground to the super-rich in years gone by, but now makes its living largely from day-trippers from the mainland, although it is possible to stay in one of the hotels on the island. The town of Capri is nestled between the two mountains on the island, featuring the central main square, Piazza Umberto with its many cafes and restaurants, surrounded by winding lanes leading into the hills. Day trips to Capri are easy to arrange. There are two companies, one operating a ferry that takes 40 minutes, the other a fast boat that takes 20 minutes, and they both leave frequently from the harbour beneath the Grand Hotel Excelsior Vittoria. Tickets can be purchased on the day, although to be sure of getting the crossing of your choice, it is advisable to purchase the day before. Any hotel will have the timetables. In the centre of Sorrento, I Giardini di Cantaldo is a lemon grower and producer of artisan limoncello, ice cream, jams and everything else that it is made from the amazing lemons of Sorrento. Guided tours can be arranged, as well as free tastings, and a visit here is a wonderful experience for anyone interested in learning more about this local gastronomic delicacy. You will never think of lemons in the same way again. Recommended. Sorrento is the major town of the Amalfi Coast, so is a good spot from which to tour this stunning part of Italy either in your own hire car, or on organised trips. The towns, including Positano, Ravello and Amalfi, are scattered along the stunning coast connected by a rather narrow winding road, are very picturesque and well worth a visit. The nearest airport to Sorrento is in Naples, to which direct flights are possible from Easyjet and British Airways.